Vatteppam - Vattayappam | Indian Cooking Challenge for March | How to make Vattayappam Step By Step Recipe! 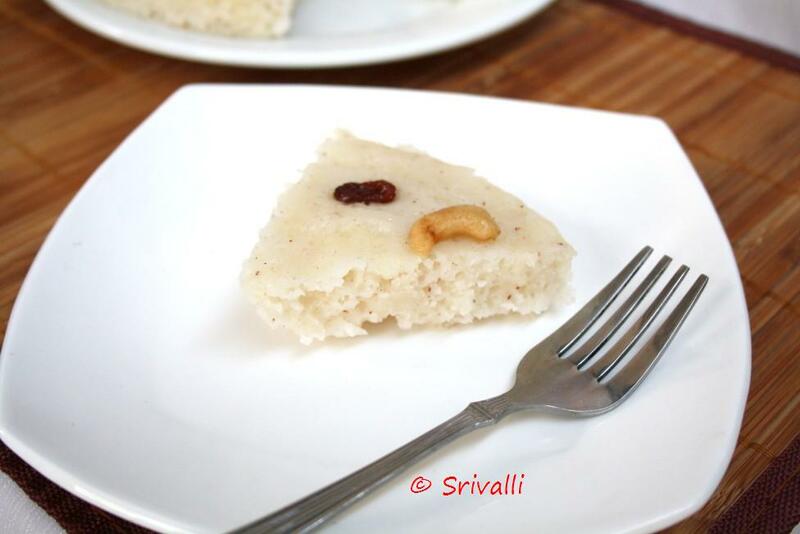 This month for Indian Cooking Challenge, we are traveling little further down to the state of Kerala to taste one of its unique dish Vatteppam/Vattayappam. I came to know about this dish from my colleague who is from Kerala and wanted to make this for us. When she did make it I was off and couldn’t taste it. I had asked her to make it again but then we never came around. Then after doing last month’s challenge I was chatting with Jayasree when I asked her if she has anything in mind to suggest for this month’s challenge from Kerala. She said she has something traditional but that might again be something very similar. Then I suddenly remembered Vatteppam and asked her if she has the perfect recipe for one. She said she remembered Shn doing this and quickly referred me to Shn’s Vatteppam. Well I love Shn’s pictures, though I never actually went through the recipes. Mostly because I am left gaping at the pictures that I forget that I should read the recipe. Well finally here comes an opportunity to do just that. I immediately sent an email to Shn asking for permission to use her recipe for Indian Cooking Challenge. She promptly replied back that she will be very glad to share her recipe. I would like to thank Shn for her delicious recipe. I attempted it during the last weekend and had it for the evening snack. It was a good experience. I took this for a verdict from my colleague and she accepted that this tasted as it should be. Only difference is that, they don’t add ghee to the batter other than greasing the pan. Well you ought to expect a variation right. Fresh coconut which we had to grind to almost a paste. 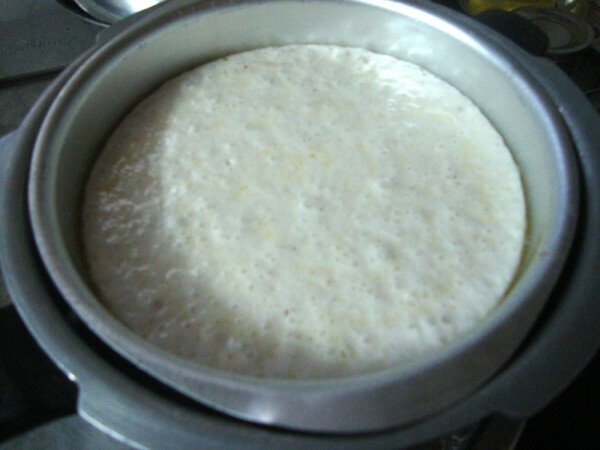 Rice porridge coming out really soft, yet to make sure it’s completely smooth we pulsed it once. Batter all read to be steamed. Garnished with cashews and raisins before doing it. 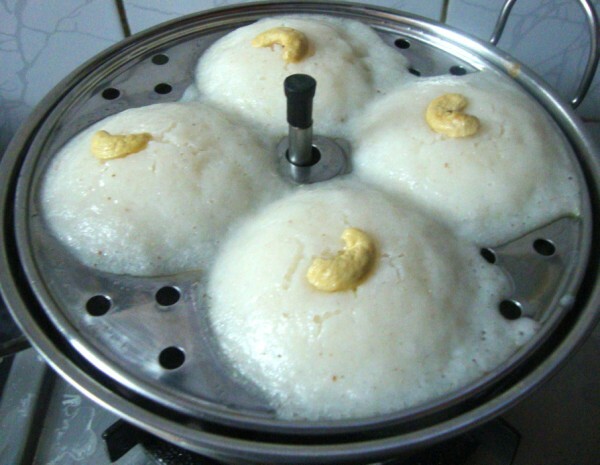 I steamed in Idli moulds too. If you want to decorate, remove the lid and gently drop in the saved cashews and raisins on the top. Water as required to get a thick Idli batter. Under other climatic conditions, it is advised to soak for longer hours for 6- 8 hrs. But the hot climate that we live in, 4 hours is more than enough. 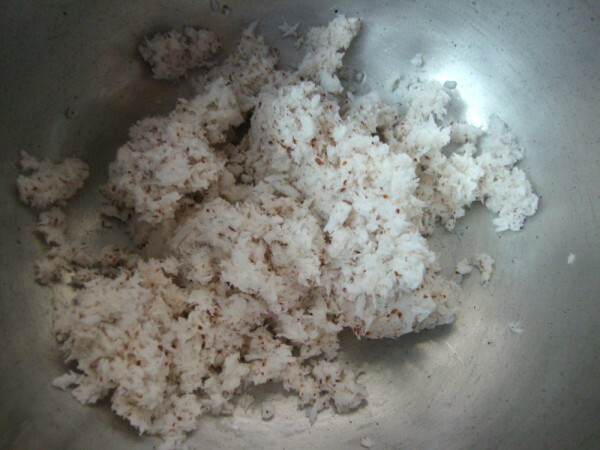 Since adding grated coconut was not anyway going to get a smooth paste, we ground it with little water to a paste. Same with cooked rice. 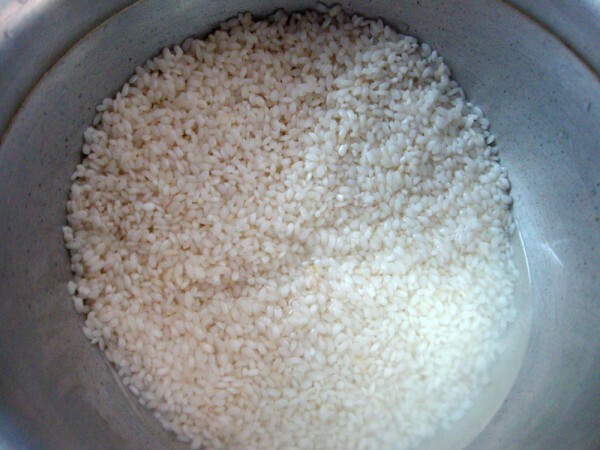 From previous experience we know that cooked rice never gets evenly ground when added at the last stage, so this was again ground to paste in a mixer before adding it to the batter. In a non stick pan, add the coarse rice batter along with water. Cook on high flame, when it starts cooking reduce it to medium flame. Continue cooking till you get a thick porridge. It takes about 5- 7 mins. We pulsed this porridge couple of times to get a lump less porridge. Heat a pan with ghee and roast both cashew nuts and raisins. Keep it aside. Wash and soak the rice for 4 hrs. Drain the rice and add to the grinder. Add just enough water to get the grinder running. If you are using a grinder, you will use less water than a mixer. Next add the ground coconut to the grinder and continue grinding to a fine batter. 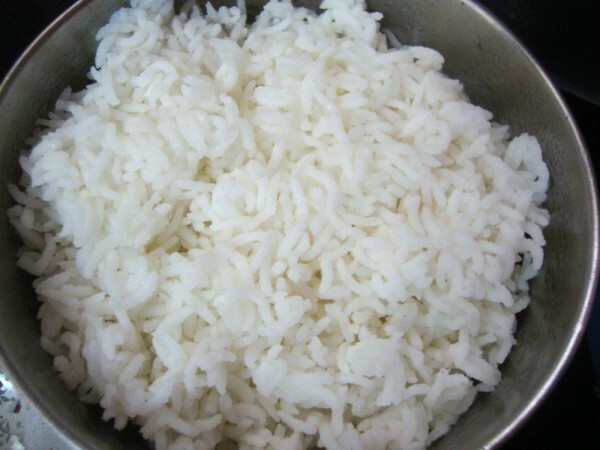 When it is almost done, add the cooked rice. Switch off when it is all blended well. Meanwhile take the yeast in a lukewarm water along with sugar. Cover with a lid. Within minutes it will foam up. While the rice is getting ground, you can make the porridge. When it is cooled completely, add about 4 tbsp to the ground batter. Run it one more time for getting it mixed well. Finally add the yeast mixture and run it one more time to blend everything well. Transfer the batter to a big enough container and let it ferment in a warm place for about 4 -6 hrs or overnight. Make sure the vessel is big enough to hold the batter that will get almost double after fermentation. 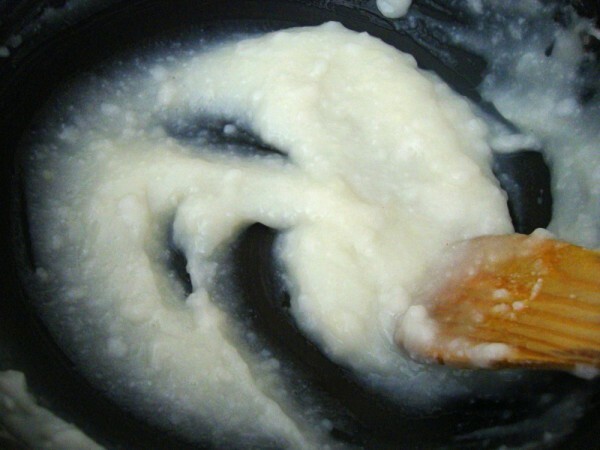 When the batter is fermented, add sugar and let it ferment again for another an hour. Just before steaming, heat a pan with ghee, roast the cashew nuts and raisins. Keep it aside. 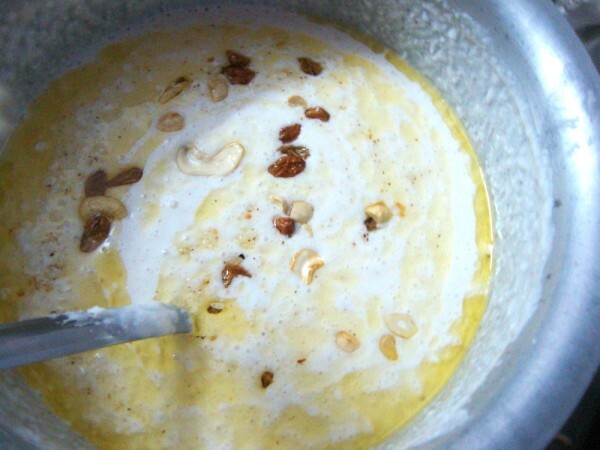 You can add the nuts, cardamom to the batter before steaming. Grease the pan with ghee and pour the batter into the greased pans. Since I used 2 cups of rice, I had quite an amount of batter. I used two cake tin, a circle and a heart shaped ones. Plus two idli plates. Use a pressure cooker for the cake tins, make sure you keep the perforated plate on the water and then over it you place the cake tin with the batter. 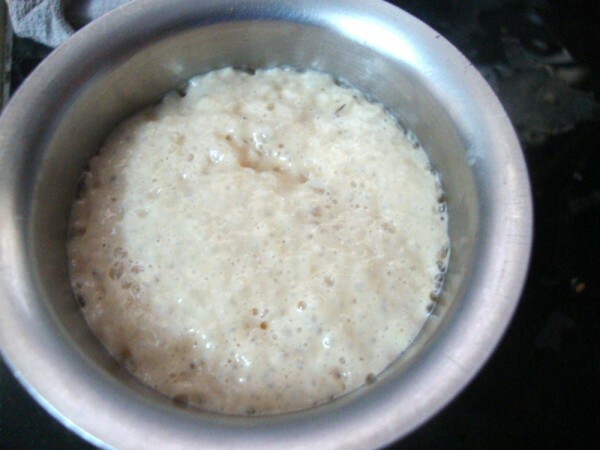 This batter is steamed just as you would steam idlis in a pressure cooker, without a whistle. Steam this for 15 – 20 mins. For the first batch it took us about 20 mins. For the second batch it took little more time. Check after 10 mins for doneness, by inserting a knife into the batter. Depending on how it comes out, you can lower the flame for 10 more minutes. I opened up after almost 10 mins to drop in some cashews and raisins on the top. 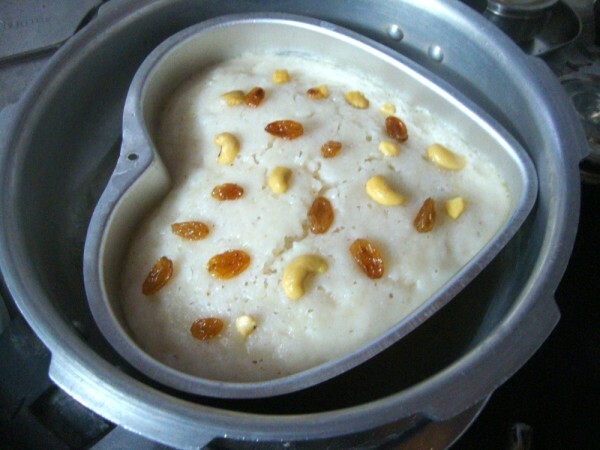 When it is completely cooled, gently separate the steamed cake from the pan and cut into desired pieces. I am told that this is served with tea/coffee. Some even serve Kadala curry with it. 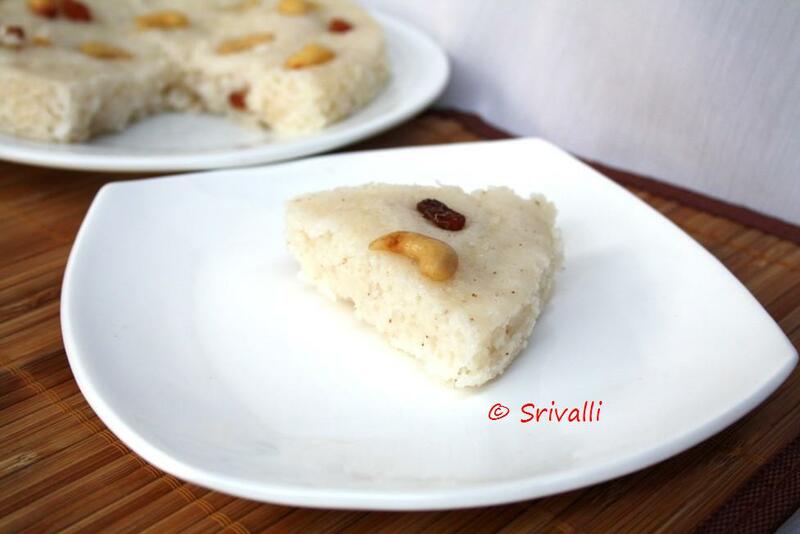 I used Idli rice but this can be made with Raw rice as well. The first batch was very porous and soft, while the second batch turned out little thick and not so porous. This happens just like the Idlis. I took this to my malayali friend, who said it tasted exactly like how they make. But they don’t use ghee at all. When she serves it as with spicy gravy, the vatteppam is mildly sweet. Else if you want you can increase the sweetness. As I have mentioned I live in a hot place and soaking and fermenting time is very less. Depending on your climatic condition you will have to adjust. Please check Shn’s post as she has given those details more clearly. After the batter is fermented we could smell a sharp yeast smell. But luckily it didn’t smell the same after being steamed. To all my ICC members, please link your Vattayappam post to Mr. Linky. Looks delicious Srivalli. Enjoyed making this speciality dish. Lovely challenge Valli. Mine didn't get as fluffy as yours, but we enjoyed them none-the-less. Looking forward to next month's challenge. Enjoy your weekend. I was very excited to take this challenge and it sure justified the result! Thanks for choosing this..looking forward to the next challenge! lovely! 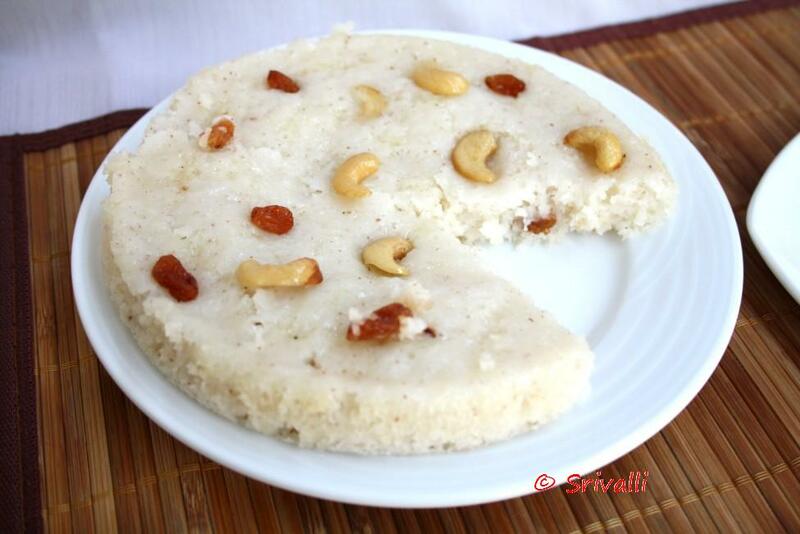 It's a perfect vatteyappam and one of my childhood favourites! I wonder how those idlis worked. I did want to try but just thought of keeping it for another time. A good one Valli. sorry dear, I could not participate this month. I hope you know my problems. Very nice challenge. Loved preparing it. Enjoyed tasting it too. Yours has come out great.. 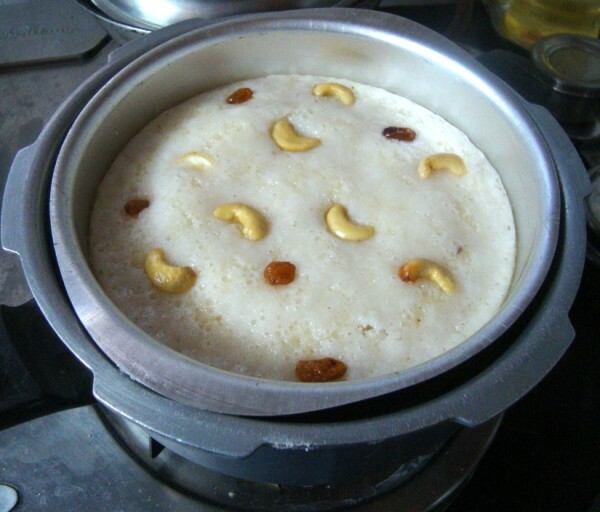 Wonderful looking vattayappam, i truly enjoyed this challenge,fabulous! Enjoyed making this valli!!!! Love those crispy cashews smiling on top of the cake!!!! 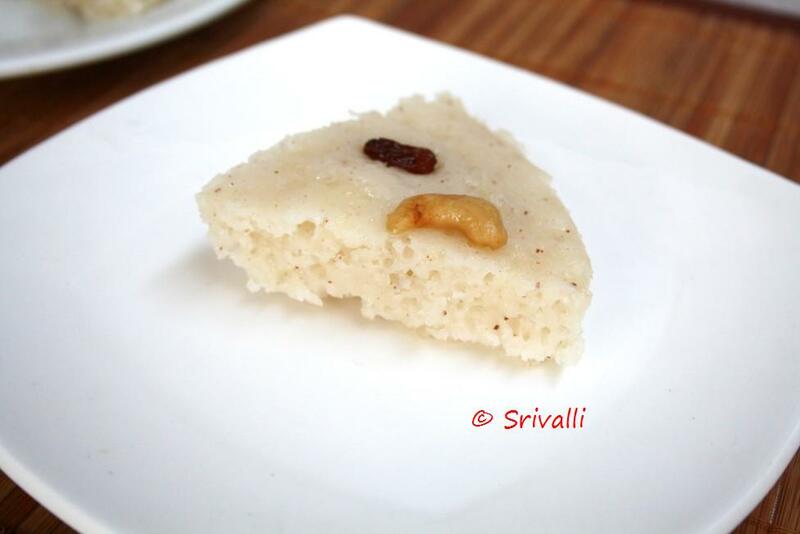 Yum Yum…Looks super soft and spongy..Srivalli What do I have to do to be part of the ICC? Wonderful challenge…glad to be a part of this. Linked mine. Wow…you have tried different shapes…Liked the step-by-step pics. Enjoyed doing this challenge. enjoyed making this dish, Urs looks fluffy and spongy. This was 1st time I attempted this dish nad it turned out surprisingly well. Thaks for setting this challenge.Your cake looks perfect. looks super soft and spongy!…must have tasted yum! Mine did not turn out that good… 🙁 and did not have time to make it again. I made this and posted. After many months I took part in it and it was fun. 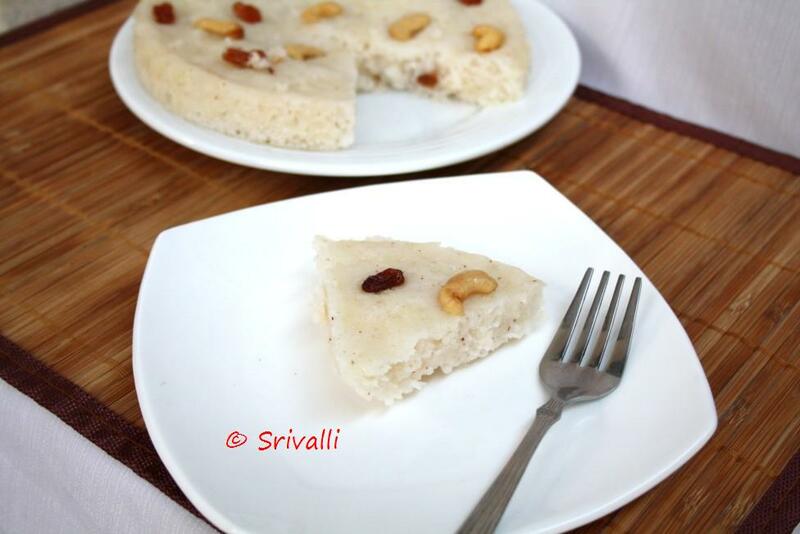 lovely vatteappam, enjoying the ICC…idlis looks good…. Interesting recipe. Enjoyed making this dish. Looking for more such delicious recipes. lovely. Looks tasty. I could not do this time.. They were good Srivalli except fo r the yeasty smell and taste. Yum! I really enjoyed my first challenge and these vattayappam were a yummy discovery!